No-Knead Bread: Fresh baked bread is a far superior experience compared to commercially produced bread with all those additives and preservatives. This recipe requires only four ingredients (flour, yeast, salt and water – how pure is that? 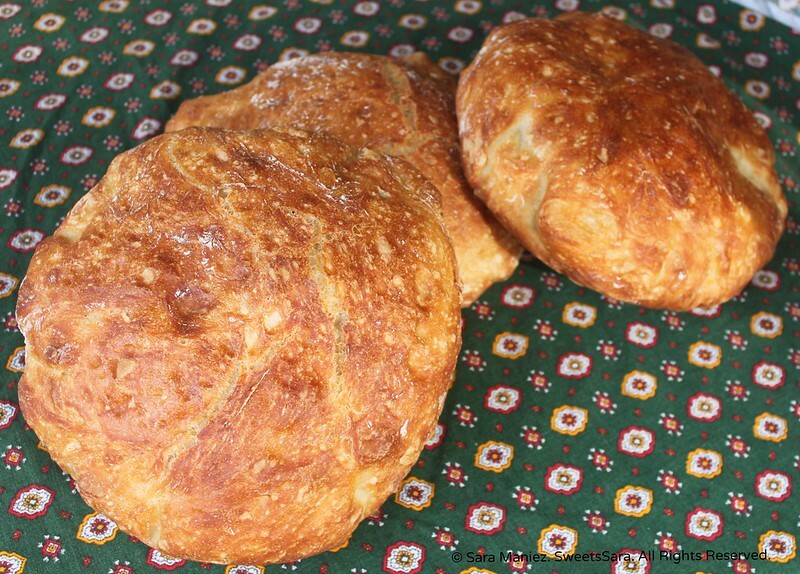 ), a little handling of the dough and with minimal effort, the result is fresh bread – you baked yourself! 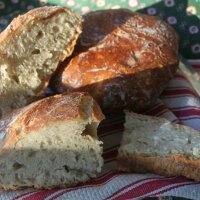 Bread can be simple and easy to make and it’s amazing that most people do not realize this – I certainly did not. Baking bread always intimidated me – perhaps it is the idea of working with yeast that seemed unpredictable and the rising time involved. It seems like more work than it really is. Yes, there is rising time, a minimum of 3 hours, plus 30 mins or so for the second rise but one can do other things during that time and just plan around it. This bread recipe is very forgiving because I have left out it for several hours more than the minimum for the first rise and it still came out great. I found with every loaf, I became more practiced and confident in my bread baking abilities. I decided several months ago, to bake our own bread instead of buying it from the grocery store. I have many reasons for baking our bread: 1. To reduce and cut out the amount of processed food we eat by making our food from scratch, 2. to save some money on the grocery bill and 3. to learn, enjoy and feel comfortable baking bread. 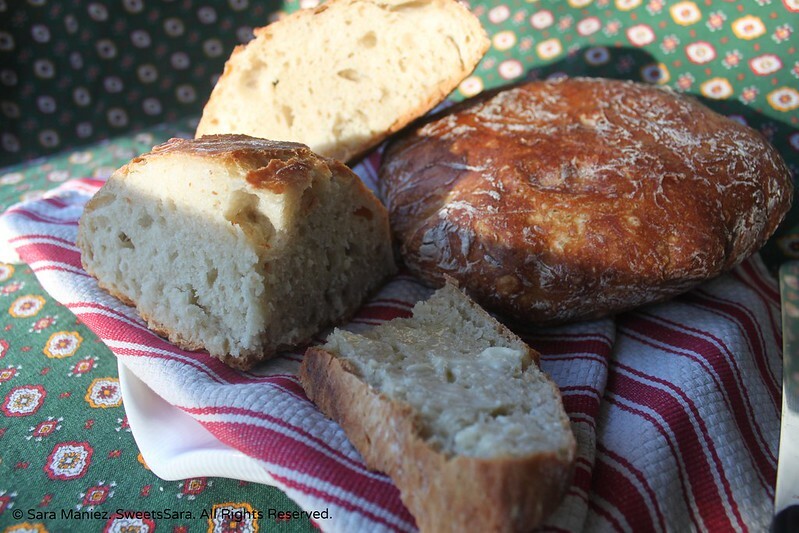 I bake this bread a couple of days a week and bake 1-2 loaves and I also enjoy baking other types now but this particular recipe is so simple and easy that is has become our staple bread for many meals. 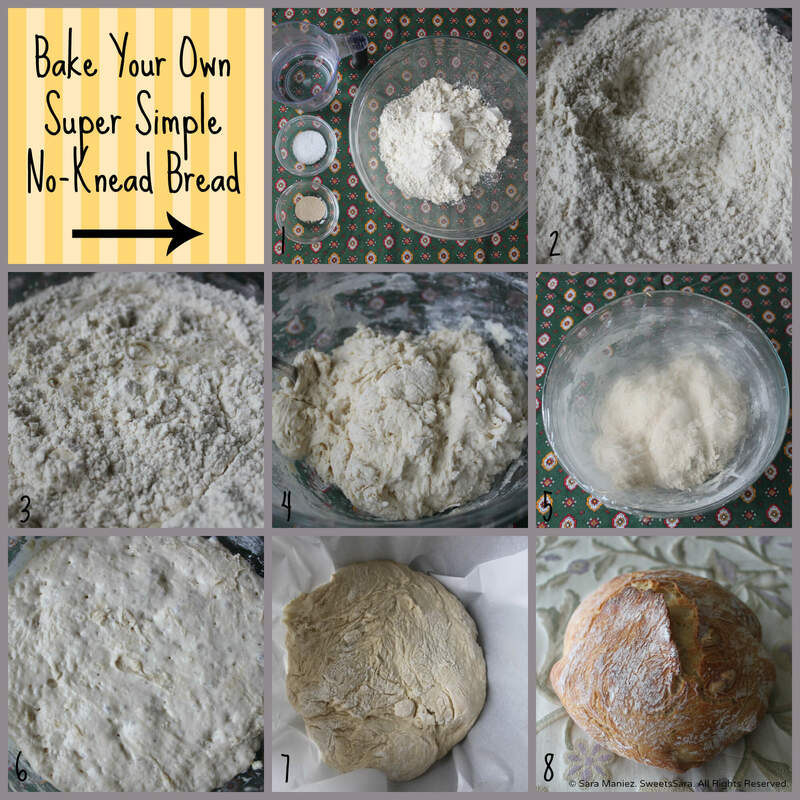 This super simple no-knead bread recipe was my “gateway bread” recipe to baking bread and I hope it will become your staple bread too or at least a fun activity to try! 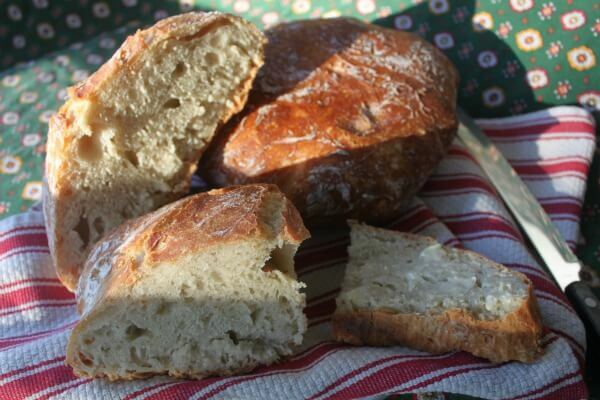 No-Knead Bread is the “The Gateway Bread” to Baking Bread! Please note that you will need a Dutch Oven for this recipe or an oven safe pot (up to 450° F) with a lid, make sure the handle on the lid is oven safe! I have had great results with my Calphalon Unison Dutch Oven but there are many others out there as well, click here for some other examples of Dutch ovens. Fresh baked bread is truly special. Each loaf has it’s own unique character. 1-1/2 cups of hot water, , 130° F, I use water hot out of the tap, make sure you do not boiling or it will kill the yeast. You can try a different type of flour, I have used wheat on many occasions with success. I find that wheat flour seems more dry and add a few tablespoons of water extra. Room temperature butter or extra virgin olive oil with salt, pepper and with other desired spices are nice accompaniments for this bread. If you have the taste for something sweet try some Nutella and fruit or use it for making French toast. This bread works well when making a strata. Jenny Jones inspired me attempt making bread on a regular basis with her faster no-knead recipe. She also has a great video and shows you how to make the bread. I encourage you to watch her wonderful video. 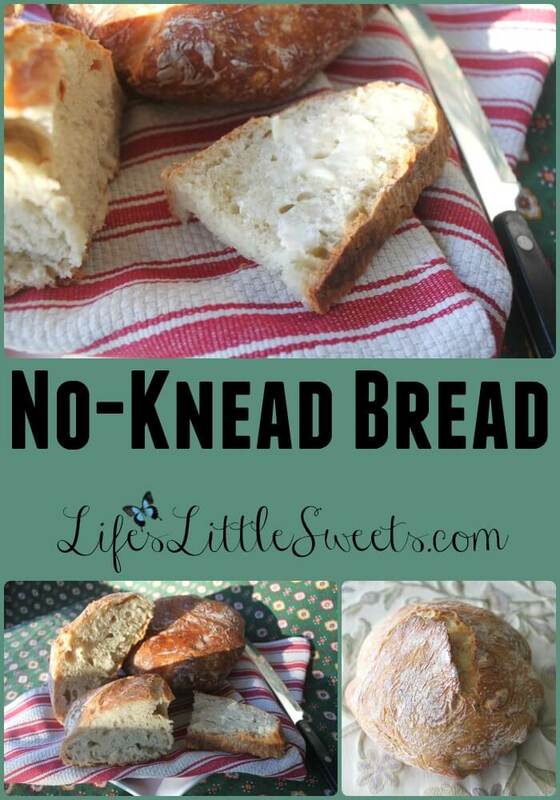 If you make “No-Knead Bread” and post a picture on social media, be sure to #lifeslittlesweets #nokneadbread and link back to the post, thank you in advance! 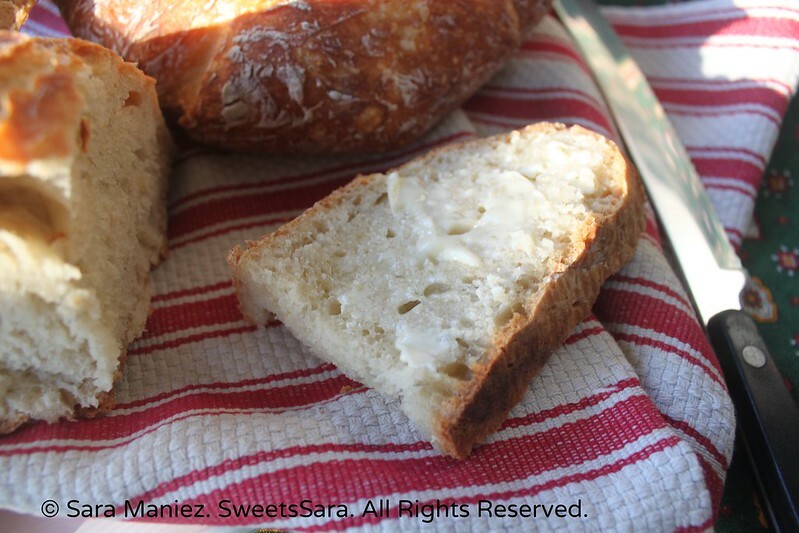 That bread looks ridiculously good – and so easy! 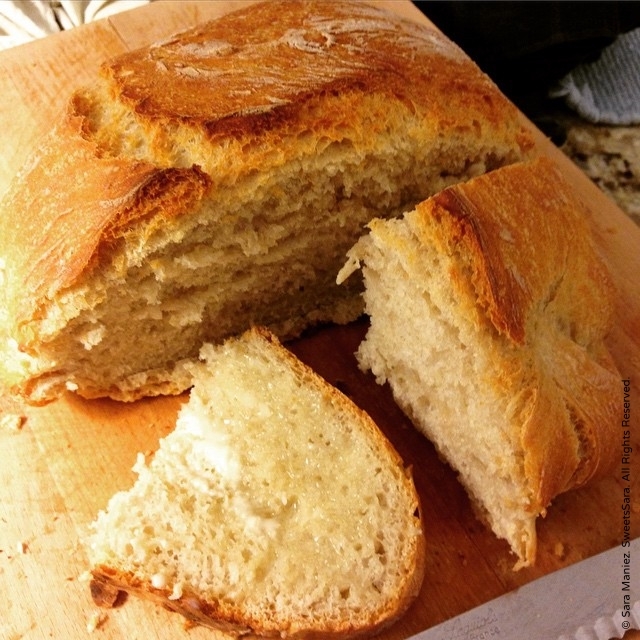 There really is nothing better than homemade bread, I love this recipe! Thanks for linking up with us for Fabulous Foodie Fridays, have a great weekend!